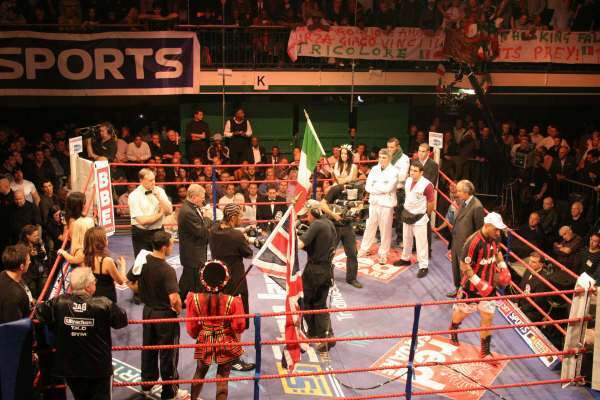 Fantastic atmosphere for Frank Maloney promoted bouts and topping the bill was David Haye versus Giacobbe Fragomeni for the European cruiserweight eliminator (WBC Final Eliminator) at the York Hall, Bethnal Green, London. 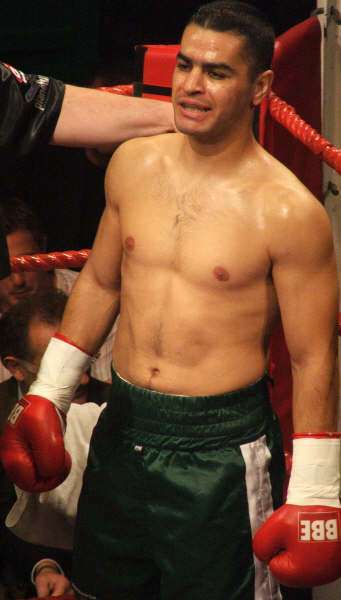 Again Fragomeni is first to stamp his authority in the ring centre and is bringing the fight to Haye and forcing the pace. 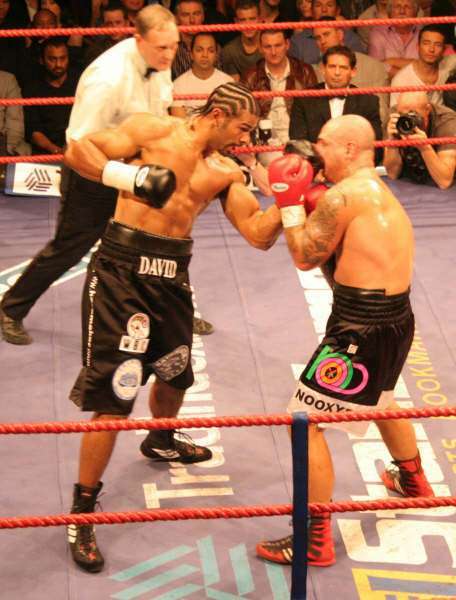 Haye starts the purposeful body attack with two sickening hard rights to the body and seems to be fighting on the inside for much of the round. 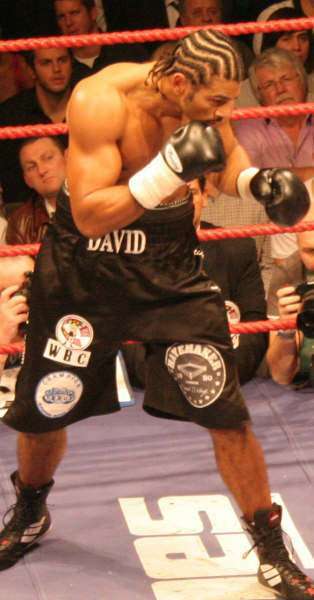 Haye comes straight out and is putting full power into every shot but again Fragomeni proves his toughness and comes through the assault and lands a heavy right cross that Haye visibly feels, The Italian bulldozes forward and is starting to back Haye up landing two chopping right crosses as the bell sounds. 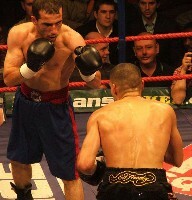 Good round for the Italian who has been hit hard to little visible effect. A slower round ensues with Haye starting to throw the right elbow in time after time, Fragomeni complains and Haye is warned by the referee. 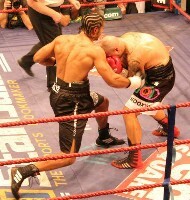 Pace slows before Fragomeni catches Haye with a bomb of a right cross and forces him to the ropes. 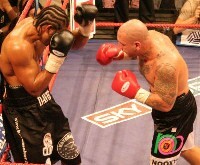 Haye catches the Italian hard and Fragomeni laughs it off as the bell sounds. 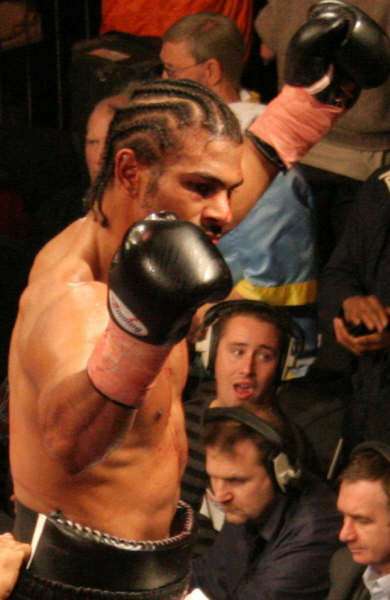 Haye comes out swinging wild punches then lands a solid right uppercut ,Fragomeni responds and the two toe to two fight for the remainder of the round. At this point the press section (myself included) are worried about Hayes Stamina as his mouth gapes open and the buzz ringside fades away as the roar of the brilliant Italian supporters comes crashing over us. Fragomeni is clearly on top now and Haye looks unsteady as the Italian thunders in a massive left cross. 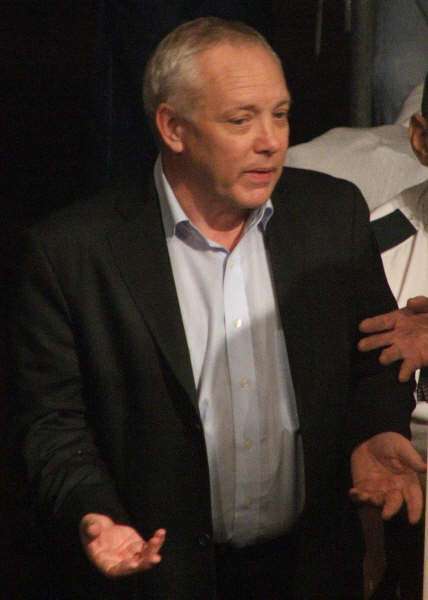 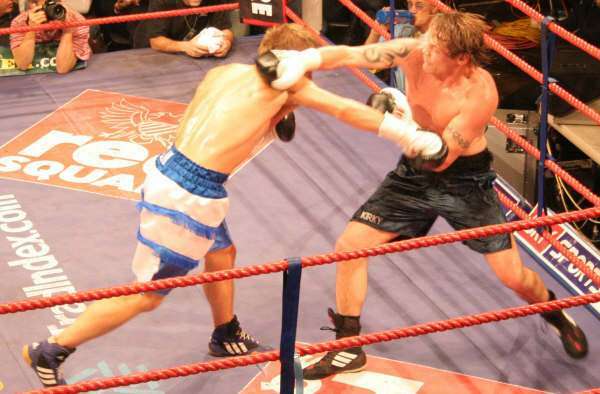 Fragomeni’s round. Fragomeni’s corner urge him to give it to Haye but it’s the Hayemaker who comes out and explodes with a barrage of heavy punches that send him reeling back. 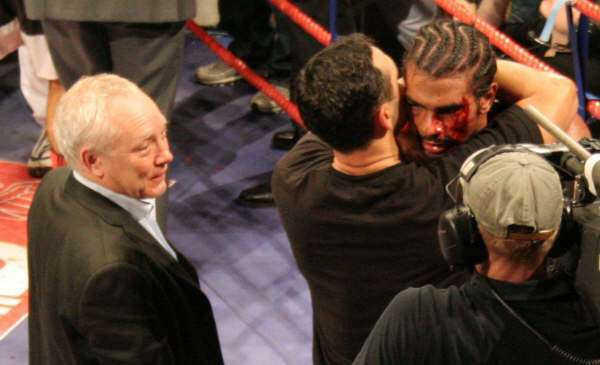 The Italian again comes surging back and backs a tired looking Haye onto the ropes, suddenly Haye is subjected to a quartet of power punches with the final blow opening a deep gash just above the outer left corner of Hayes left eye. The crowd roar, the blood flows and we Haye a war in the York Hall. 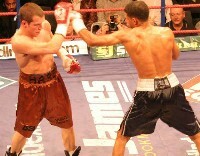 Brilliant round and the crowd erupt in appreciation of both fighters. Fragomeni is obviously targeting the cut and moments later reopens it with a toe solid one, two, combinations that back a wobbly Haye up onto the ropes again. 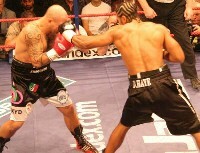 Fragomeni comes flying in eager to finish and lands some menacing uppercuts as Haye again hangs on. Great round for the tough, tough Italian and I have him ahead now by 1 round. Haye with the blood flow seemingly staunched comes out with his right hand very low, grabs Fragomeni who works well on the inside lands solid left and right hooks that have the blood flowing again. 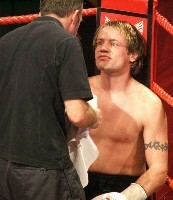 The whole left side of Hayes face is a mask of blood as the Italian again lands more heavy punishment. 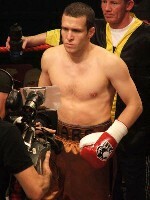 Fragomeni is starting to breathe heavily as the beel sounds. 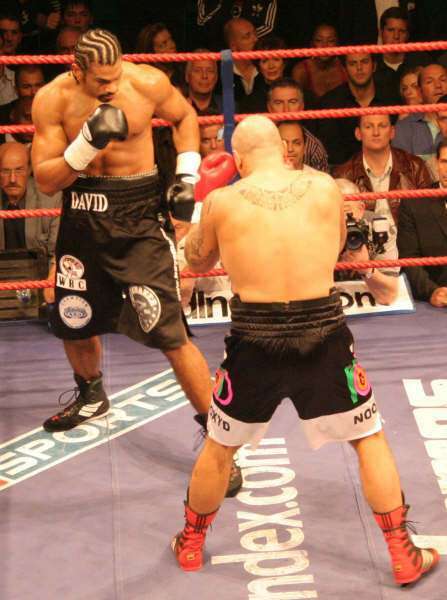 Haye surprisingly seems to have a second wind and immediately takes center ring and stands his ground and the Italian is now looking very tire. 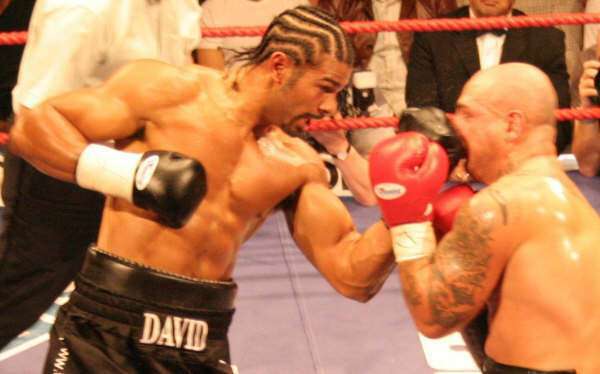 Haye explodes with a massive 14 punch onslaught that begins with a sickening left body shot that shakes Fragomeni to his boots. 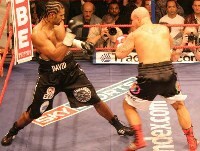 Fragomeni backs up and buckles on the ropes as Haye jumps all over him to finish in devastating style. 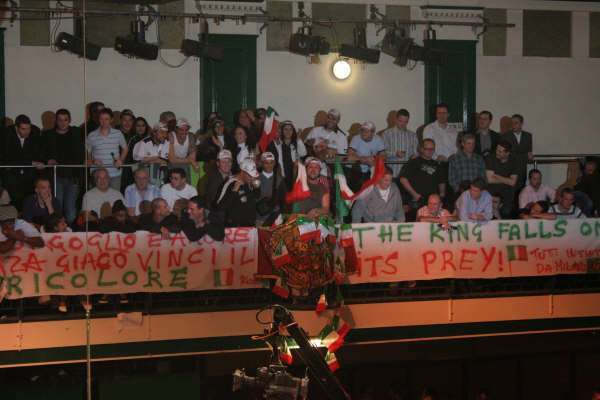 At the count of nine the Italian corner have seen enough and Haye raises his hands to an ecstatic York Hall crowd before leaping onto the ringpost and roaring out a bloody faced message to O’Neil Bell. Fantastic fight, a real brawl, that had everything and ending with Haye earning his 2007 WBC Cruiserweight title shot with bell in fine style. 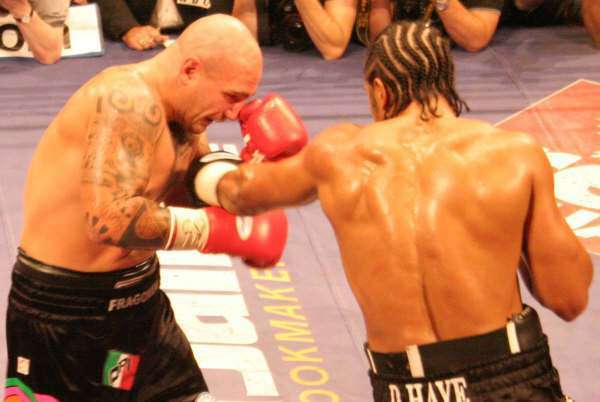 We learned a lot about the Hayemakers heart and desire in this fight and but full marks must go to Fragomeni, who fought his heart out and was a great challenger and exactly what Haye needed. 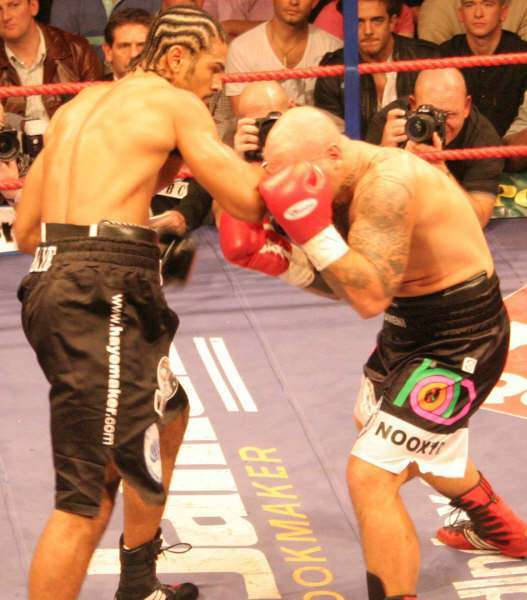 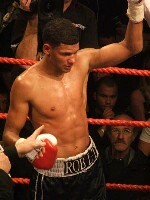 Haye v Bell looks set to be an excellent WBC title match up in 2007. 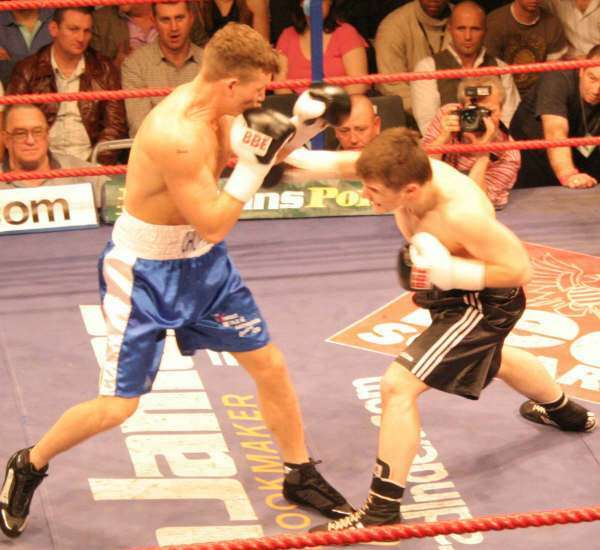 On the brilliant undercard side of things before the main event,the fights panned out as follows..
Matt Lewis (Colchester) and Ian Wilson (Camden) kick things off in a four round war at super featherweight with a scrappy first round giving way to a blistering second ,that saw Wilson’s poor defence exposed with some hard left crosses fired in from Lewis. 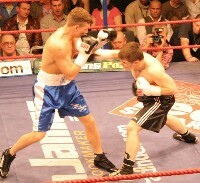 In the third round a brilliant exchange ensues with both men toe to toe for the majority of the round. 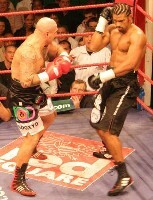 In the final round both men again go toe to toe with neither man giving up ground,Wilson ends the round just on top and claims the victory. 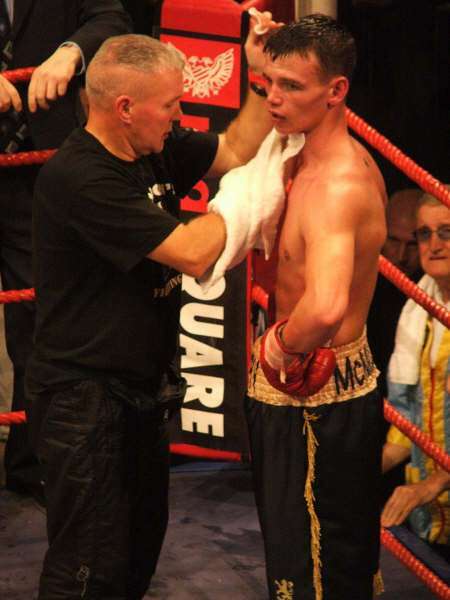 Next up was the Welterweight clash between Scott Woolford (Margate) and Gary McMillan over four rounds. 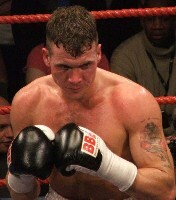 Woodford takes the opening round with some nice combinations and keeps his hands and high with an excellent defence. 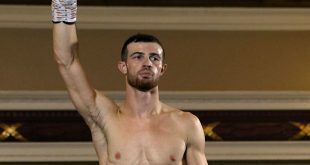 In the second round Woolford catches the Scotsman flush with two hard left hooks that send him staggering backwards,McMillans head clears as he comes back with his own hard left crosses that even up the round. 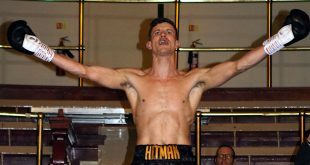 The third round see’s the two men evenly matched and a quick look at the sky sports monitor reveals that it is the scott who has out-landed Woolford 24-20. 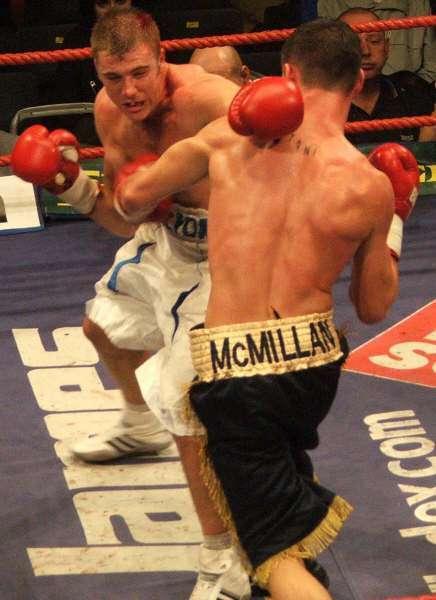 In the final round things turn to war as both men meet head on and throw wild punches with McMillan eventually backing his man up and getting on top. Amazingly the ref holds Woolfords hand aloft as the bell sounds. 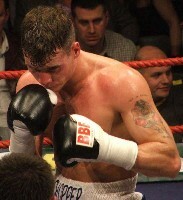 The majority of the ringside press all agree that at very least a draw is what he deserved. 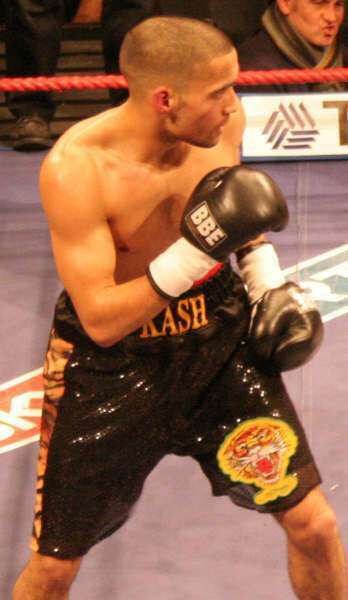 In a tame Featherweight contest Akash Bhatia (Harrow) narrowly outpointed Youssef Al Hamidi (Dewsbury) 39-38,followed by Robert Taylor’s (Hayes) power punching victory on points over James Hare (Robertown) in 6 rounds. 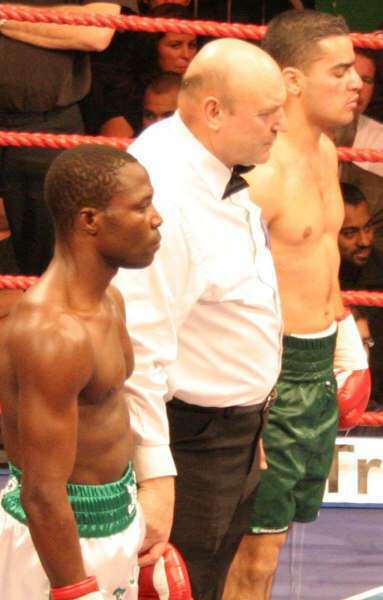 The most eagerly anticipated undercard of the evening turned out to be the least entertaining and the most controversial with Ojose Olusegan (London) and Franck Aiello (France) meeting scheduled at Light welterweight over 8 rounds. Olusegan comes out in the opening round and immediately lands some thunderous left and right crosses that all land flush on the Frenchman,these are followed by a sweet right cross to the temple,Olusegan looks strong as the round ends. 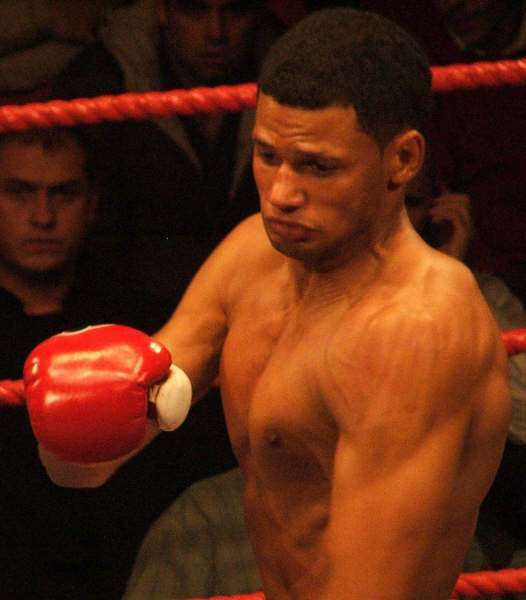 In the second Olusegan throws massive overhand rights wildly and suddenly the ref leaps in and brings the fight to it’s end. 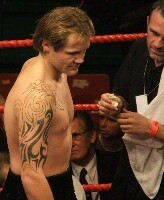 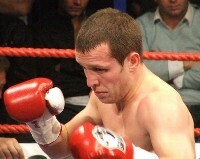 All at ringside are divide as to whether the Frenchman could carry on and I personally believed he was fine to do so. 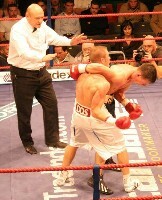 Bad decision by the ref that put the brakes firmly on what should have been a great fight. 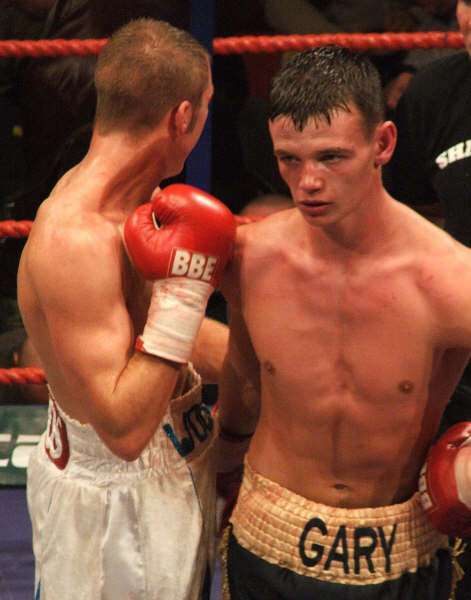 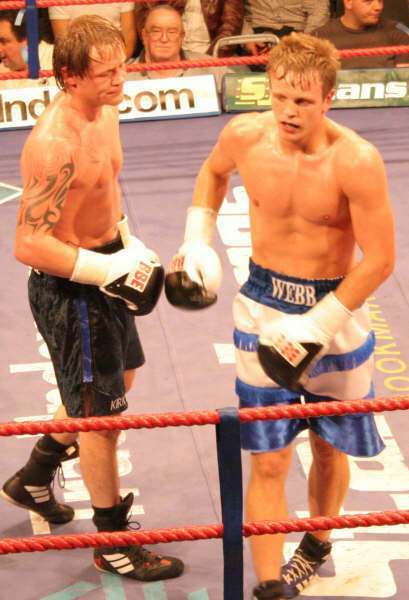 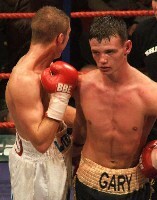 Sam Webb (Chislehurst) and David Kirk (Sutton in Ashfield) met at light middleweight over four rounds with Webb easily outpointing the seemingly limited Kirk. 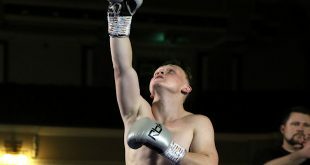 Finally on the bill we had Paul Porter (Luton) and Gareth Perkins (Swansea) meeting in a four round bout at welterweight with Porter taking the first round with some lovely skills and some hard right hands to the body. 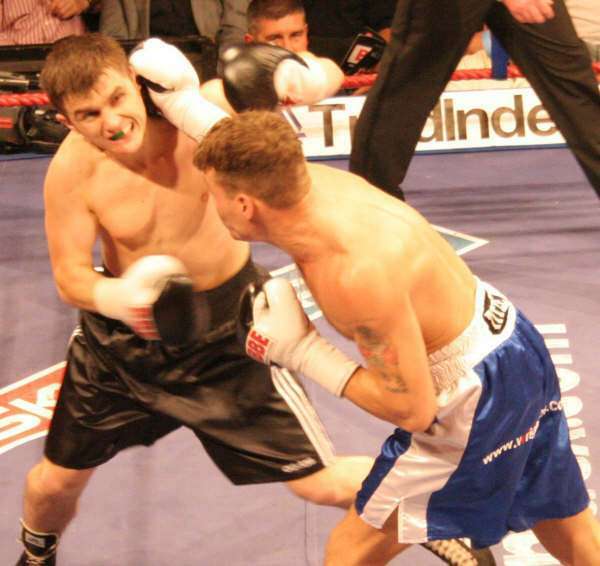 In round two Porter did little and was always fighting on his back foot,which allowed perkins to unload some good punches and win the round. 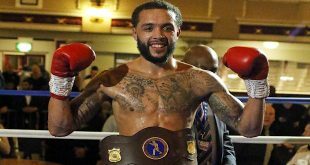 The third round is where things get dirty with both fighters warned for heads and elbows,things settle as Porter lands the more telling blows and claims the round with a sweet flurry of left and right crosses. 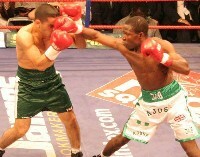 In the final round Porter again lands heavy blows that have Perkins wobbled momentarily. Perkins clears his head and fires back some cracking shots just before the bell sounds and snatches the draw. 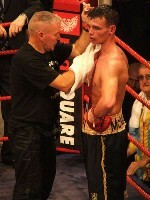 A great night was had at the legendary York Hall and big thanks must go out to Frank Maloney for his support.